GARRY Codman isn’t the easiest man to get hold of. Phone lines ring and ring and two of his companies’ websites have been taken offline in the past fortnight. 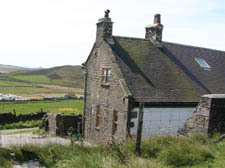 The address listed on official business records is a hill top cottage in the village of Quarnford, a short drive from Buxton. Travel up the gravel drive, past a field of grass-chewing sheep and you find the little house – but there is little chance of finding anyone at home. The postman hasn’t seen anybody for weeks and neighbours said that his family have moved on. Mr Codman, 38, the rock-climbing director of Adventure Care Limited, declined the opportunity to talk to the New Journal when reporters finally traced him to his mobile phone on Tuesday morning. It is a shame because Mr Codman and his partner Helen Slater, a co-director, are two of the best-placed people to shed light on Salma’s final months. It was Adventure Care, advertised as a short term therapeutic centre, that was paid £2,800 a week by Camden Council to look after her. The centre is made up of the Quarnford house – now up for sale and described as ‘a Marie Celeste’ by one local because of its deserted appearance – and three cottages scattered around neighbouring villages. It offers education alongside activities such as climbing and mine explorations. Before it was taken offline, Adventure Care said on its website that it was being inspected 33 times a month by independent visitor and social care consultant Louise Barker. It also claimed Helen Macukiewicz from the Commission for Social Care Inspection is its current inspector. Not so, she said when the New Journal called her to check. When the New Journal contacted the centre, its managers would not say how many places it holds, although it was advertising placements up until last week, just before the website was taken down.